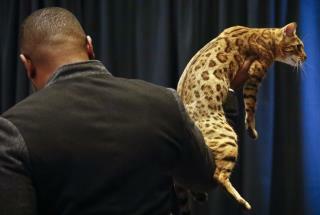 (Newser) – A decision by the country's top dog show to admit—gasp!—cats is raising eyebrows. The felines will be added to a side event at the annual Westminster Dog Show called "Meet the Breeds" that permits ordinary humans to "play" with some of the country's most prestigious canines, NPR reports. "There are booths that depict the country and origin of the animal," an American Kennel Club rep tells USA Today. "So cats are joining that and many will be dressed up." There was no word on what the felines might be wearing during the Feb. 11 event, though organizers added the 40 cat breeds will take part in an agility contest where they'll be led through a sort of obstacle course, a rep tells NPR. I will enjoy the can opener race. But it delighted me to devil our cats by opening up a can of green beans and watch them come running. Then I would take out a couple beans and put it in their dish. Then they look up at me and state with their eyes, "What the f is that?" One thing for sure, is that there will be no working breed category for cats.